It was recently brought to our attention here at CBD School that Joy Organics (a brand we’ve reviewed, had great results with, and regularly use personally), was found to contain a certain fungicide in one of their products. 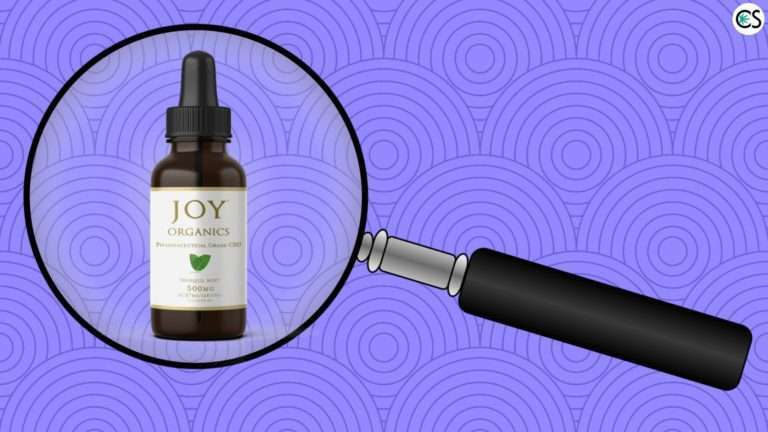 Because of our own positive experience with Joy Organics, when it was flagged (along with three other CBD companies) for being “troublesome,” we knew we had a to take a deeper look. We contacted Joy Organics to ask them more about it…and received a response almost immediately. “Yes, we are. It is just with the Orange Tincture in December. We replaced everyone who purchased that product in December. We also instituted new third party lab testing, so this won’t happen again. Here’s a link to our page showing our 3rd party lab reports on all our products. Starting April 1st, our QR codes will not only link to the 3rd party lab results on the final product, but also on each ingredient in the products, including the raw CBD oil. We will setting a new bar of testing in the industry. No one is doing this level of testing, including the largest manufacturers of CBD in the US. Not only did Joy Organics get back to us quickly, but we feel they’re doing things right by going above and beyond to correct what went wrong. At CBD School we talk to many CBD companies on a regular basis. We can assure you that not all of them would take the steps Joy Organics has with the problem they faced. In an industry where total transparency and the highest-quality customer service are vital for continued success, we’re sure Joy Organics will continue to come out on top, despite the fact that one of their tinctures was discovered to contain a certain fungicide commonly used on citrus fruits. We’d like to commend Joy Organics not only for getting back to us so quickly on the issue, but also for taking the right steps to clear things up. When it comes to CBD companies, transparency is everything. When third party lab results recently fell short of the standards this company has set for themselves in the CBD industry, they immediately took care of the problem. And then set their standards even higher for future lab test results. 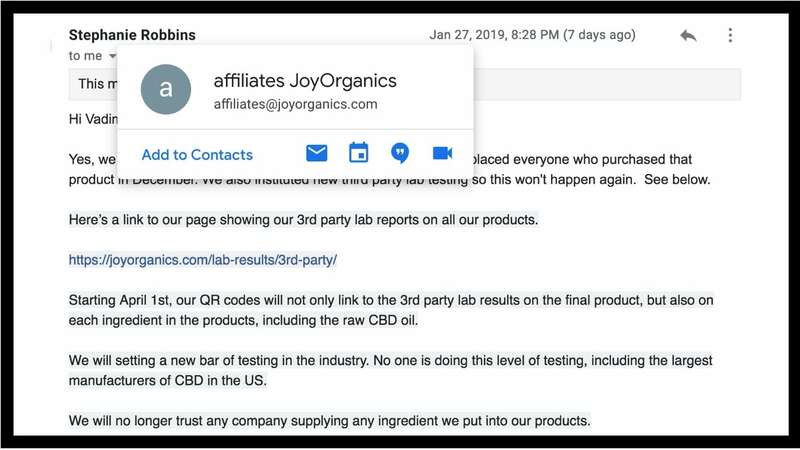 Shortly after they were flagged, Joy Organics put an announcement out on their blog page to inform their customers about what had happened. After announcing that they had become aware that Imazalil, a fungicide commonly used on citrus fruits, was found in third-party lab test results, they sent products from that same batch to two other certified, third-party labs. One of the tests came back positive for Imazalil, while the second came back ND (non-detectable). In the notice on their blog page, we feel that Joy Organics did an excellent job of not only bringing attention to and explaining the problem in precise detail, but also offered solutions for what they planned to do to ensure nothing like this would ever happen in the future. No matter where you’re shopping for CBD, we can’t stress how important it is that lab results of the companies you’re looking at are easily available on their website. Search them out! Third-party lab results are critical when it comes to CBD. Not only do these test results ensure that you’re getting a “clean” product without any pesticides, fungicides, or other contaminants, but that you’re actually getting what you think you’re getting. This includes exactly how much CBD your CBD oil really contains. Take one of the other companies that was flagged for being “troublesome.” JustCBD’s 550mg tincture contained only 1.8mg of CBD per serving…one-tenth of the amount that was listed on the bottle. Basically, this $75 bottle of CBD oil tincture contained around the same amount of CBD found in the company’s 50mg bottle that costs $15. According to Joy Organics, the tincture that tested positively for Imazalil, was an older formula produced in a small batch. This brings up why it can be important to email a company to make sure the lab results printed on the company’s website are just what they say they are. Even if you were to read the lab reports (which not everyone does), do you really know what it is you’re looking for? If you’re adamant about taking high-quality CBD (which you should be), it’s really important to know how to read third party lab reports. We’ve mentioned it a few times before, but what are these lab reports and why are they so important when it comes to quality CBD? The cannabis industry is largely unregulated. This means that CBD and other cannabis products aren’t approved by the FDA (aside from Epidiolex, which is an entirely different story). What this means is that pretty much anyone can market a product they claim is quality but is actually anything but. You see, CBD products can be labeled anything they want. Manufacturers can claim they’re offering an all-natural, organic, high quality product, but is it really what they claim? Here’s where third party lab test results come in. They offer proof of what’s really in the product you’re purchasing. Without them, how else would you know what’s in your CBD oil? Remember, CBD is unregulated, meaning (almost) anything goes. Third party results give you the assurance that you’re receiving a quality product free from anything that could be a potential health risk. So, now that you know the basics of why you should know how to read third party lab results, it’s time to learn the basics about what to look for. Cannabinoid Profile and Potency Analysis: Third party test results should tell you exactly how much of each cannabinoid your CBD oil contains. This includes both CBD and THC levels, as well as other cannabinoids contained in the cannabis plant. These could include: THCV, CBG, CBC, CBN, THCA, CBDA, and CBGA. Third party lab reports should let you know exactly how much CBD and THC is present in that particular batch of oil. For example, on the most recent batch of Joy Organics third party results for their 500mg Orange CBD Oil, not only are the major cannabinoids listed, but “Max CBD” levels are listed at 17mg/ml. Since their products contain zero THC, there are no results for THC listed. Companies that do use a full spectrum CBD hemp oil that contains trace amounts of THC, however, should clearly display the percentage of THC in their third party results. Pesticide Analysis: The last thing you want your CBD oil to contain is any lingering pesticides, fungicides, herbicides, or fertilizers. This is the part of the lab test results to look at to make sure you’re getting a “clean” product that’s free of any of these potentially risky byproducts. Residual Solvent Analysis: In order to become the oil that makes its way into tinctures, capsules, and other products, CBD must first be extracted from the hemp plant. This can be done through various extraction processes, which can result in residual chemical solvents present in the oil itself. Class One: Solvents that are suspected carcinogens or that pose an environmental hazard that should be avoided in the processing of cannabis extracts. Class Two: Solvents that are not used outside of Good Manufacturing Practice (GMP), which include animal carcinogens, reversible neurotoxins, or teratogens. Class Three: Solvents that contain low potential for toxicity (not known to pose a risk to human health) and are the only class suggested to be used in cannabis extracts. Microbiological Analysis: In the process of cultivating hemp, the potential for microbial contamination is always present. While it rarely happens, you don’t really want any living organisms hanging out in your CBD oil. This is where microbiological analysis comes in, assuring consumers there aren’t any bacteria present in your CBD oil that could pose a potentially serious health risk. And there you have the basics of reading third party lab results on your own! Once you know what to look for, reading lab results is easy…and can ensure you’re getting a product that’s exactly what it claims to be. We’d like to wrap things up by commending Joy Organics for taking the steps necessary to make right what went wrong when one of their products tested positive for a known fungicide. We also wanted to use this opportunity to let you the consumer know that these things happen in the still maturing CBD hemp industry. And that’s precisely why it’s so important for you to read the test results of a product before you purchase! Remember if you can’t find lab results on a brand’s website, reach out to their customer service team to inquire about the most recent batch’s lab report. I commend this company. I am glad to see a few CBD oil companies trying to be transparent. I recently had a run in with a Hempworx sales rep. She asked me if I was familiar w cbd oil. When I told her what I used. Joy Organics. She proceeded to send me a link to a 3rd party testing showing heavy metals in a 1000 mg mint tincture. So I went and dug around this company’s website and background. Not much testing shown on their own website. Only the first page of old testing from May 2018. I shot back at her asking for the rest of the testing pages as well as recent data. She ignored me. So it is incredibly important that we as consumers clearly understand how to buy a clean cbd oil. I am so grateful for your blog and podcast. I keep sharing away and begging my friends to research first bf buying!! Hey Gina! Thanks for your comment and sharing your feedback 🙂 We always love hearing from the subscribers and listeners of the CBD School Podcast! Joy Organics sells ‘full spectrum’ oils, and thats a scam since they use CBD isolate for their tinctures. You are talking about transparency yet failed to take a look at their analysis sheets. This site is schooling none, smh. Hello Robert, thank you for your comment and concern. This verbiage is something we have struggled with as it is what our competitors use but we agree it is not accurate. As of April 1, all our labels will switch to broad spectrum versus full spectrum. The site will be updated as well. We will link to a detailed description to explain why we use “broad spectrum” versus versus the full spectrum wording. We apologize for any confusion our original wording may have caused. We strive to be transparent and clear but are a work in progress.